for christmas gifts for my friends, i tried to be thoughtful/creative. it can be difficult to create that perfect, useful gift without giving the gift that says "i'm really cheap and used scrap wood from my basement" but i riskily (is that a word?) went for it and used old wood from my basement. originally from my old kitchen cabinets. and then i used chalkboard paint, painter's tape, sand paper, and a sharpie. merry christmas, from those of us who are into easy DIYs and practical gifts. --find something to paint. in my case, wood that i cut to size from old kitchen shelves. --sand it down, so that the paint is absorbed...and so it won't peel off! --press the painter's tape into whatever space on your board that you want to be left blank. i made each one differently, and on some i taped the edges so that the chalkboard part was centered on the board. on another, i merely taped an angled corner. make sure to use your fingernail and reallllly seal the painters tape, or else the paint will bleed under. --slap the paint on there. wait til it dries. do it again. wait til it dries. take the tape off. --add your hand lettering in the space where the tape was, using your sharpie. 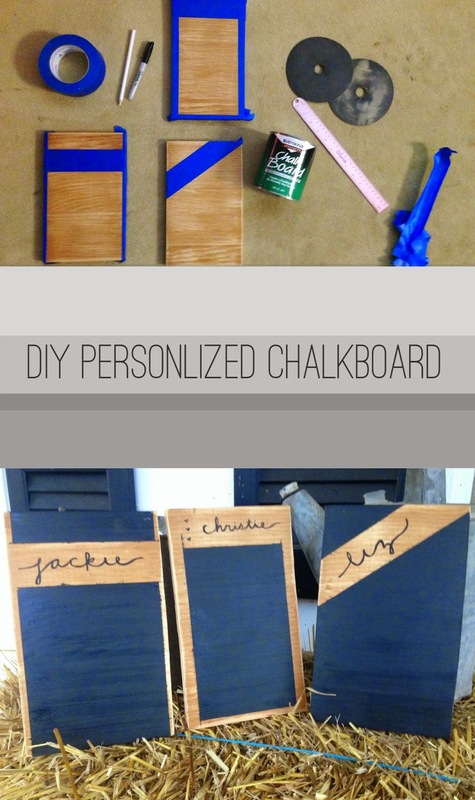 have you made anything with chalkboard paint? i'd love to hear your craft ideas! my sister made me a chalkboard mug once! she dipped the bottom 1/2 of the mug in chalkboard paint & left the top 1/2 white. then drew a Christmas tree on it and wrapped it! i thought it was neat! Using chalkboard paint on a mug is such a good idea! A mug wouldn't break as easily (as my chalkboard painted wine glasses did.) Can't wait to see what you do with your blackboard paint!